Now make your way down the laneway as located on the map (right before Franklin Street). As you continue walking through the laneway, you will notice several different pieces that have been tagged over including the one above. In this work, someone has sprayed over the piece with white and there are also boxes placed in front of the work. It looks as though people have not accounted for this eye capturing artwork. Throughout this alleyway, there is a ton of graffiti over individuals’ pieces and comments of artists’ opinions. Everyone has a different opinion of what is right and wrong in the street art profession. Some believe that street art and graffiti is for voicing ones opinion and it is okay to write over others’ works. However, others look at some pieces as valuable works of art, but others as vandalism. 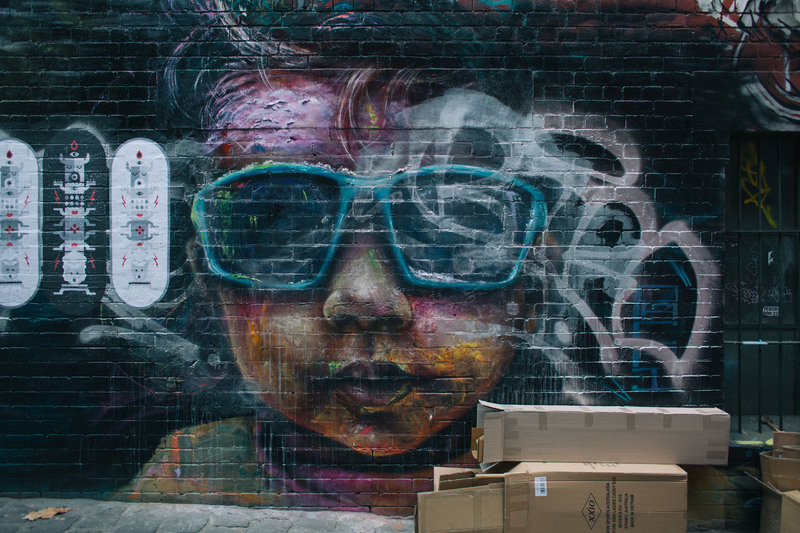 There is no clear line between vandalism and art, but that Melbourne is always full of amazing artwork. “2nd Stop: Laneway Next to Queen Victoria Market,” Street Art deTours, accessed April 20, 2019, http://streetartdetours.com/document/1228.